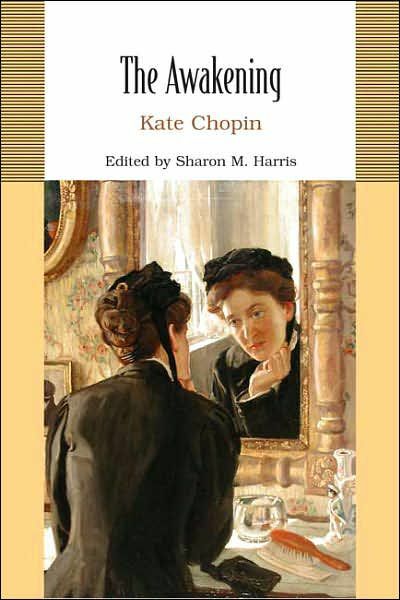 Kate Chopin's novel, The Awakening is the famous tale of Edna Pontellier, who leaves her family, commits adultery, and begins to rediscover her true self--as an artist. It is considered to be one of the most important early feminist texts. Here are a few famous quotations from the novel. "Mr. Pontellier wore eyeglasses. He was a man of forty, of medium height and rather a slender build; he stooped a little. His hair was brown and straight, parted on one side. His beard was neatly and closely trimmed." 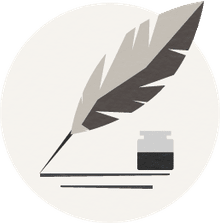 "'You are burnt beyond recognition,' he added, looking at his wife as one looks at a valuable piece of personal property which has suffered some damage. She held up her hands, strong, shapely hands, and surveyed them critically, drawing up her fawn sleeves above the wrists." "He reproached his wife with her inattention, her habitual neglect of the children. If it was not a mother's place to look after children, whose on earth was it?" "The mother-women seemed to prevail that summer at Grand Isle. It was easy to know them, fluttering about with extended, protecting wings when any harm, real or imaginary, threatened their precious brood. They were women who idolized their children, worshiped their husbands, and esteemed it a holy privilege to efface themselves as individuals and grow wings as ministering angels." "The voice of the sea is seductive; never ceasing, whispering, clearing, murmuring, inviting the soul to wander for a spell in the abysses of solitude; to lose itself in mazes of inward contemplation. The voice of the sea speaks to the soul. The touch of the sea is sensuous, enfolding the body in its soft, close embrace." "Her marriage to Leonce Pontellier was purely an accident, in this respect resembling many other marriages which masquerade as the decrees of Fate. It was in the midst of her secret great passion that she met him. He fell in love, as men are in the habit of doing, and pressed his suit with an earnestness and ardor which left nothing to be desired." "A feeling of exultation overtook her as if some power of significant import had been given her to control the working of her body and her soul. She grew daring and reckless, overestimating her strength. She wanted to swim far out, where no woman had swum before." "That she was seeing with different eyes and making the acquaintance of new conditions in herself that colored and changed her environment, she did not yet suspect." "The past was nothing to her; offered no lesson which she was willing to heed. The future was a mystery which she never attempted to penetrate. The present alone was significant..."
"I would give up the unessential; I would give my money, I would give my life for my children, but I wouldn't give myself. I can't make it more clear; it's only something which I am beginning to comprehend, which is revealing itself to me." "She was seeking herself and finding herself in just such sweet, half-darkness which met her moods. But the voices were not soothing that came to her from the darkness and the sky above and the stars. They jeered and sounded mournful notes without promise, devoid even of hope." "It sometimes entered Mr. Pontellier's mind to wonder if his wife were not growing a little unbalanced mentally. He could see plainly that she was not herself. That is, he could not see that she was becoming herself and daily casting aside that fictitious self which we would assume like a garment with which to appear before the world." "'Woman, my dear friend, is a very peculiar and delicate organism--a sensitive and highly organized woman, such as I know Mrs. Pontellier to be is especially peculiar. It would require an inspired psychologist to deal successfully with them. And when ordinary fellows like you and me attempt to cope with their idiosyncrasies the result is bungling. Most women are moody and whimsical. This is some passing whim of your wife, due to some cause or cause which you and I needn't try to fathom.'" "Her husband seemed to her now like a person whom she had married without love as an excuse." There was something in her attitude, in her whole appearance when she leaned her head against the high-backed chair and spread her arms, which suggested the regal woman, the one who rules, who looks on, who stands alone." The water of the Gulf stretched out before her, gleaming with the million lights of the sun. The voice of the sea is seductive, never ceasing, whispering, clamoring, murmuring, inviting the soul to wander in abysses of solitude. All along the white beach, up and down, there was no living thing in sight. A bird with a broken wing was beating the air above, reeling, fluttering, circling disabled down, down to the water." "She looked into the distance, and the old terror flamed up for an instant, then sank again."